The Vatican & the Holocaust: Table of Contents|Defenses of Pope Pius|"We Remember"
Pope Pius XII's (1876-1958) actions during the Holocaust remain controversial. For much of the war, he maintained a public front of indifference and remained silent while German atrocities were committed. He refused pleas for help on the grounds of neutrality, while making statements condemning injustices in general. Privately, he sheltered a small number of Jews and spoke to a few select officials, encouraging them to help the Jews. The Pope was born in 1876 in Rome as Eugenio Pacelli. He studied philosophy at the Gregorian University, learned theology at Sant Apollinare and was ordained in 1899. He entered the Secretariat of State for the Vatican in 1901, became a cardinal in 1929 and was appointed Secretary of State in 1930. Throughout the Holocaust, Pius XII was consistently besieged with pleas for help on behalf of the Jews. The Pope did speak generally against the extermination campaign. On January 18, 1940, after the death toll of Polish civilians was estimated at 15,000, the Pope said in a broadcast, "The horror and inexcusable excesses committed on a helpless and a homeless people have been established by the unimpeachable testimony of eye-witnesses. "(14) During his Christmas Eve radio broadcast in 1942, he referred to the "hundreds of thousands who through no fault of their own, and solely because of their nation or race, have been condemned to death or progressive extinction. "(15) The Pope never mentioned the Jews by name. In a September 1940 broadcast, the Vatican called its policy "neutrality," but stated in the same broadcast that where morality was involved, no neutrality was possible. (18) This could only imply that mass murder was not a moral issue. The Church also answered a request to save 6,000 Jewish children in Bulgaria by helping to transfer them to Palestine. At the same time, however, Cardinal Maglione wrote to the apostolic delegate in Washington, A.G. Cicognani, saying this did not mean the Pope supported Zionism. (26) The church did often help baptized Jews, but was less enthusiastic about assisting Jews who did not abandon their faith. One of the only cases in which the Pope gave early support to the allies was in May 1940. He received information about a German plan, Operation Yellow, to lay mines to deter British naval support of Holland. 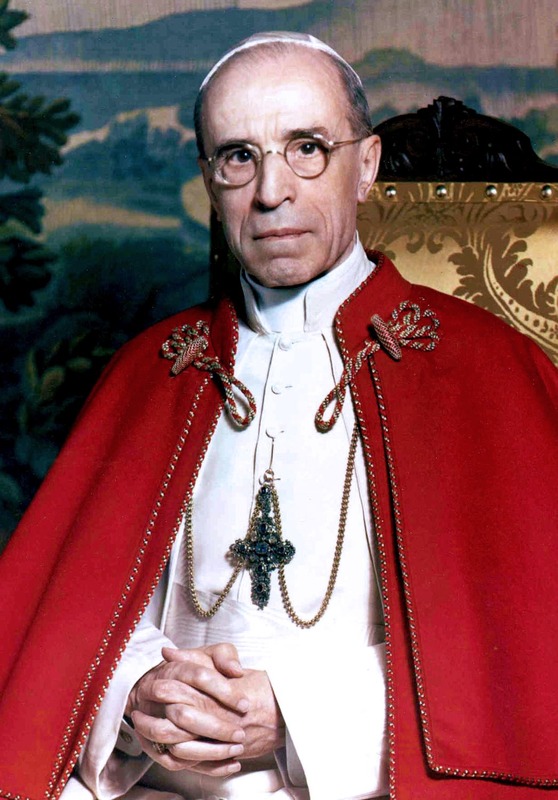 Pius XII gave his permission to send coded radio messages warning papal nuncios in Brussels and The Hague of the plot. The German radio monitoring services decoded the broadcast and went ahead with the plan. (28) This papal intervention is surprising due to the pope's persistent claim of neutrality, and his silence regarding almost all German atrocities. Wistrich also notes that while there is some controversy about the pope’s assistance to the Jews, the Church's role in helping Nazi murderers escape, and seeking clemency for convicted Nazi criminals, is well-documented. It is less clear, however, how much the pope knew about this. The International Catholic-Jewish Historical Commission (ICJHC), a group comprised of three Jewish and three Catholic scholars, was appointed in 1999 by the Holy See's Commission for Religious Relations with the Jews. In October of 2000, the group of scholars finished their review of the Vatican's archives, and submitted their preliminary findings to the Comission's then-President, Cardinal Edward I Cassidy. Their report, entitled "The Vatican and the Holocaust," laid to rest several of the conventional defenses of Pope Pius XII. The often-espoused view that the Pontiff was unaware of the seriousness of the situation of European Jewry during the war was definitively found to be inaccurate. Numerous documents demonstrated that the Pope was well-informed about the full extent of the Nazi's anti-Semitic practices. A letter from Konrad von Preysing, Bishop of Berlin, that proved that the Pope was aware of the situation as early as January of 1941, particularly caught the attention of the commission. In that letter, Preysing confirms that "Your Holiness is certainly informed about the situation of the Jews in Germany and the neighboring countries. I wish to mention that I have been asked both from the Catholic and Protestant side if the Holy See could not do something on this subject...in favor of these unfortunates." The letter, which was a direct appeal to the Pope himself, without intermediaries, provoked no response. In 1942, an even more compelling eyewitness account of the mass-murder of Jews in Lwow was sent to the Pope by an archbishop; this, too, garnered no response. The commission also revealed several documents that cast a negative light on the claim that the Vatican did all it could to facilitate emigration of the Jews out of Europe. Internal notes meant only for Vatican representatives revealed the opposition of Vatican officials to Jewish emigration from Europe to Palestine. "The Holy See has never approved of the project of making Palestine a Jewish home...[because] Palestine is by now holier for Catholics than for Jews." Some Catholic higher-ups violated this position of the Vatican by helping Jews to immigrate when they were able to; most did not. Similarly, the attempts of Jews to escape from Europe to South America were sometimes thwarted by the Vatican. Vatican representatives in Bolivia and Chile wrote to the pontiff regarding the "invasive" and "cynically exploitative" character of the Jewish immigrants, who were already engaged in "dishonest dealings, violence, immorality, and even disrespect for religion." The commission concluded that these accounts probably biased Pius against aiding more Jews in immigrating away from Nazi Europe. The claim that the Vatican needed to remain neutral in the war has also been refuted. In January of 2001, a document recently declassified by the U.S. National Archives was discovered by the World Jewish Congress. The document was a report in which Monsignor Giovanni Battista Montini, Pope Pius XII's secretary of state, detailed and denounced several abuses committed by the Soviet Army against German inhabitants of the Soviet Union. The report was widely viewed as demonstrating that the Vatican had no compunctions about speaking out against atrocities, even when doing so would violate neutrality. After decades of Jewish groups and historians asking the Vatican to open its archives to allow them to see all the documents related to the pope and the Holocaust, Pope Francis announced on March 3, 2019, that they would be made accessible in March 2020. Over the last 13 years, 20 members of the Vatican’s archives department have been organizing Pius XII’s files, which include records of all Papal decrees, encyclicals and Vatican diplomatic correspondence. The Pope's reaction to the Holocaust was complex and inconsistent. At times, he tried to help the Jews and was successful. But these successes only highlight the amount of influence he might have had, if he not chosen to remain silent on so many other occasions. No one knows for sure the motives behind Pius XII's actions, or lack thereof, since the Vatican archives have only been fully opened to select researchers. Historians offer many reasons why Pope Pius XII was not a stronger public advocate for the Jews: A fear of Nazi reprisals, a feeling that public speech would have no effect and might harm the Jews, the idea that private intervention could accomplish more, the anxiety that acting against the German government could provoke a schism among German Catholics, the church's traditional role of being politically neutral and the fear of the growth of communism were the Nazis to be defeated. (36) Whatever his motivation, it is hard to escape the conclusion that the Pope, like so many others in positions of power and influence, could have done more to save the Jews. Joan Gralla, WJC Says it Has New Evidence Against Pius XII, Reuters, (January 11, 2001). 1. “Reassessing Pope Pius XII's Attitudes toward the Holocaust,” Jerusalem Center for Public Affairs, (October 2009). 1a. Berenbaum, Michael, The World Must Know, p. 40. 2. Perl, William, The Holocaust Conspiracy, p. 197. 3. Gutman, Israel, Encyclopedia of the Holocaust, p. 1136. 4. Gutman, Israel, Encyclopedia of the Holocaust, p. 1136. 5. Gutman, Israel, Encyclopedia of the Holocaust, p. 1136. 6. Gutman, Israel, Encyclopedia of the Holocaust, p. 1137. 7. Perl, William, The Holocaust Conspiracy, p. 206. 8. Hilberg, Raul, Perpetrators Victims Bystanders, p. 267. 9. Gutman, Israel, Encyclopedia of the Holocaust, p. 1137. 10. Israel Pocket Library, Holocaust, p. 133; Gutman, Israel, Encyclopedia of the Holocaust, p. 1137. 11. Israel Pocket Library, Holocaust, p. 134. 12. Hilberg, Raul, The Destruction of the European Jews, p. 315. 13. Gutman, Israel, Encyclopedia of the Holocaust, p. 1137; Hilberg, Raul, Perpetrators Victims Bystanders, p. 264. 14. Gilbert, Martin, The Second World War, p. 40. 15. Gutman, Israel, Encyclopedia of the Holocaust, p. 1137. 16. Gutman, Israel, Encyclopedia of the Holocaust, p. 1137. 17. Perl, William, The Holocaust Conspiracy, p. 200. 17a. “Reassessing Pope Pius XII's Attitudes toward the Holocaust,” Jerusalem Center for Public Affairs, (October 2009). 18. Perl, William, The Holocaust Conspiracy, p. 200. 19. Israel Pocket Library, Holocaust, p. 133. 20. Perl, William, The Holocaust Conspiracy, p. 202. 21. Gilbert, Martin, The Holocaust, p. 623. 22. Perl, William, The Holocaust Conspiracy, p. 201. 23. Gutman, Israel, Encyclopedia of the Holocaust, p. 1138. 24. Gilbert, Martin, The Holocaust, p. 701. 25. Perl, William, The Holocaust Conspiracy, p. 176. 26. Gutman, Israel. Encyclopedia of the Holocaust, p. 1138. 27. Israel Pocket Library, Holocaust, p. 136. 28. Gilbert, Martin. The Second World War, p. 59. 28a. “Reassessing Pope Pius XII's Attitudes toward the Holocaust,” Jerusalem Center for Public Affairs, (October 2009). 30. Peter Carlson, “A Diplomat's Diary,” Washington Post, (April 22, 2004). 31. Jewish Telegraphic Agency, (April 23, 2004). 32. Jerusalem Report, (February 7, 2005). 33. Jerusalem Post, (December 4, 2006). 34. “Pius XII: Vatican to open secret Holocaust-era archives,” BBC, (March 4, 2019). 35. Efraim Zuroff, “Questions Remain Regarding The Opening Of Vatican WWII-Era Archives,” Jerusalem Post, (March 4, 2019). 36. Gutman, Israel, Encyclopedia of the Holocaust, p. 1139.